Lessons from Cialdini: what can we learn from hotel towels? We are strongly persuaded by what people like us do. Guests who were told that most other guests reused their towels, were 26% more likely to reuse their towels than those who saw the standard message. 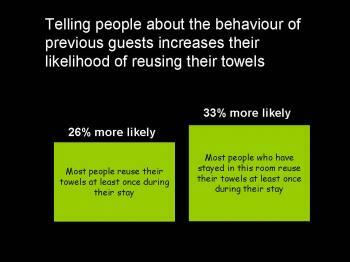 Guests who were told that most other guests who stayed in their particular room, were 33% more likely to reuse their towels than those who saw the standard message. So what does this mean when you are seeking to persuade in a presentation. use statistics to show how many people are using your product or taking action (this is taking it from the micro to the macro). 2. Be subtle about the way that you do this. If you tell people “Of course, you’re going to be persuaded by what other people have done” this will backfire on you. When Cialdini asked people whether other people’s behaviour influences their own, they insisted that it did not. We don’t like to think of ourselves as simply doing what other people do. The book authors experimented with these signs. They used marked pieces of petrified wood along the trails to see how much visitors would steal. When there was no sign 2.92% of the pieces were stolen. When the sign above was used, 7.92% of the pieces were stolen! So despite the good intentions of the National Park management they were actually promoting the stealing of petrified wood. Persuasion based on what other people do is called using “Social Proof”. As you can see it’s a powerful persuasive tool for using – with care and discretion – in your presentations. In the next post in this series, I’ll look at the surprising results that Cialdini and his co-authors report on the use of negativity in persuasive messages. It’s a handy book alright! A very easy read. That said, the whole concept of Social Proof and so on is often hard to bring into presentations, isn’t it. I suggest that, essentially, because a large percentage of our clients are giving “cutting edge” presentations – by which I mean they’re presenting on something so new that, almost by definition, there’s precious little other work out there that they can make reference to. Okay, there are ways around it, I know but it’s something to think about.